On Tuesday 2 and Wednesday 3 May H.S.H. Prince Albert II conducted an Official Visit to Bratislava (Slovakia). 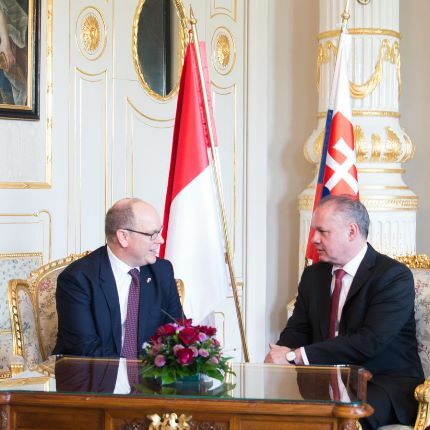 On Tuesday 2 May, the Sovereign Prince was welcomed at the Presidential Palace by the Slovak President, H.E. Andrej KISKA. The two leaders were able to enjoy discussions on common issues such as the economic cooperation between their countries, their respective relationships with the European Union and topics related to current affairs. The two heads of state then joined the Slovakia-Moldavia Economic Forum to attend the signing of an economic cooperation agreement between the Slovak CCI and the Monaco Economic Board. The Slovak economy is one of the most dynamic in the European Union and this Central European country has become extremely attractive to investors. The Sovereign Prince was also invited to lunch by the Prime Minister, Mr Robert FICO. H.S.H. the Prince wanted to visit the “Gate to Freedom” memorial, a monument erected at the confluence of the Danube and Morava to the memory of the several hundreds of men and women killed on the Czechoslovakian border when attempting to escape the “iron curtain” from 1945 to 1989. The day ended with an official dinner at the Presidential Palace. On Wednesday 3 May, the Prince visited the DANUBIANA Museum of Modern Art and the X-Bionic Sphere sporting complex in Samorin.